"I created 'Golden Waters' so when the public engages with the work, they are not only drawn in, but are able to stop, think and observe," artist Grimanesa Amoros explained to the Huffington Post. "By looking, we are informing ourselves and deciding how to get involved with what we see. During the moment of engagement, the work hopefully takes viewers into a space of reflection where they themselves might be surprised by their reactions." 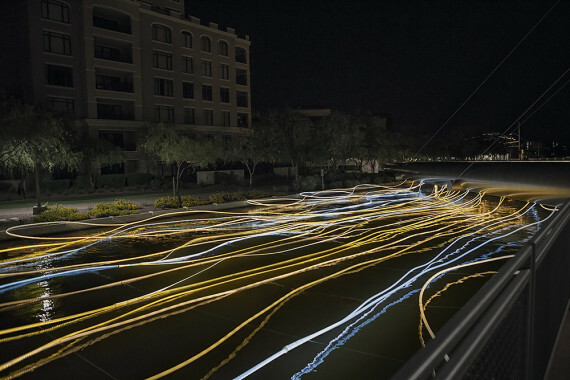 Amoros is the mind behind "Golden Waters," an electric artistic intervention spread atop the 50-mile-long body of water that is the Arizona Canal. Using an LED tubing system, Amoros crafts a glowing serpentine stream at the nexus of light and water, nature and metropolis. Born in Lima, Peru, Amoros was inspired by her childhood travels when crafting the public art piece as well as the Peruvian people's ability to combine beauty and survival. "As a teenager, growing up in Lima, I would travel throughout Peru whenever I could," she said. "My goal was to see as many of the country’s historical sites as possible." Specifically, Amoros was moved by the Uros Islands in Lake Titicaca in southeast Peru, floating islets made entirely out of totora reeds. "The pre-Incan Uros people, who lived on 42 self-fashioned floating islands, built everything out of these reeds -- from houses to watch towers." "The Uros people are very similar to the Hohokam people. They both used ingenuity to survive and improve their existence." The Hohokam people, also known as the Canal Builders, were another major source of inspiration for Amoros. "They developed an ingenious irrigation system that enabled them to become the most skillful farmers in the Southwest as early as 300 A.D.," she said. 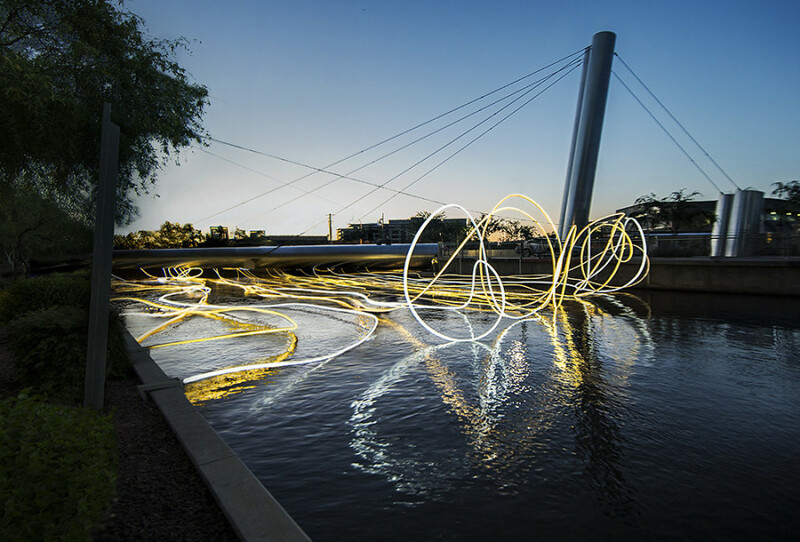 Their use of the canal inspired the central concept behind "Golden Waters," Amoros' piece. Amoros' work has long employed the wondrous beauty of light to explore concepts of identity, home and community. According to Pheonix New Times, the artist discovered her passion for the stuff accidentally during a sleepless night in Iceland. "Unable to sleep one night, she went outside and witnessed an incredible display of lights in the northern sky. Tempted to grab her camera, she decided instead to simply stay in the moment. But she longed to share the moment with others, and it’s informed her practice ever since." "Golden Waters," sponsored by Scottsdale Public Art, will be on view in Scottsdale, Arizona until Sept. 30, 2015.